Photo Credit: Kelly White. Engineers verify that the radios performed a communications relay by watching the video streams from each vehicle and sending it back to the commander vehicle via a radio network. Army engineers demonstrated autonomous robots as part of a teaming effort to evolve natural interaction between soldiers and autonomous systems during an exercise in Joint Base McGuire-Dix-Lakehurst, N.J., Nov. 2-3. 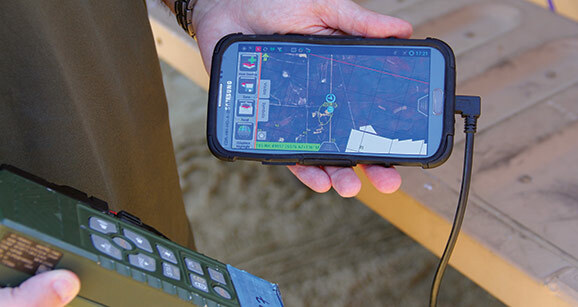 This interaction allows for one soldier to use numerous unmanned systems, which require neither dedicated operators nor significant cognitive burden on the part of commanders. The U.S. Army Communications-Electronics Research, Development and Engineering Center Technology Enhancements in Autonomous Machines, or C-TEAM, was rapidly initialized to focus on the single mid-term exercise. The team used two Modular Detection and Response System, or MDARS, robots for the demonstration. The demonstration incorporated a tactical scenario to show relevance of how this capability can be integrated into a mission to benefit the soldier. Photo Credit: Kelly White. 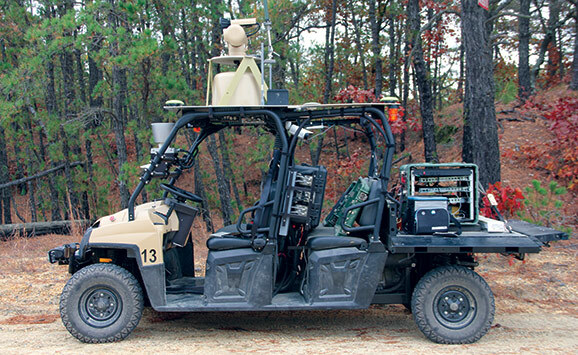 A Modular Detection and Response System robot used during the Communications-Electronics Research, Development and Engineering Center-Technology Enhancements in Autonomous Machines Robotics Demonstration at Range 1 on Joint Base McGuire-Dix-Lakehurst, New Jersey. The two MDARS navigated autonomously to their destinations while the C-TEAM followed in a chase vehicle, and engineers verified that the radios provided a communications relay by watching the video streams from each vehicle and sending it back to the commander vehicle via a radio network. Chuck Shoemaker, lead for autonomous systems at CERDEC, said the concept of the demonstration was to show how the commander can leverage unmanned ground vehicles, or UGVs, to create beyond line-of-sight communications; use mission command applications to create plans and task the UGVs to execute mission, leverage the sensors on board the unmanned systems for situation awareness; and get eyes-on-target for target detection and engage the enemy from beyond line-of-sight. The idea was the culmination of a year-plus collaborative effort consisting of four CERDEC directorates to include the Command, Power and Integration Directorate, or CP&I, the Space & Terrestrial Communications Directorate, Night Vision and Electronic Sensors Directorate, and the Intelligence and Information Warfare Directorate. 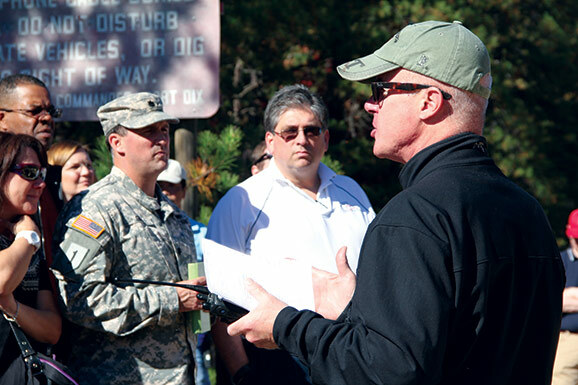 Assisting in this effort were several industry contractors, supporting the MDARS as a platform and the development of a high-performance planner that allows the MDARS to operate off-road. During his opening remarks, Gary Blohm, CERDEC CP&I director, emphasized all systems, manned and unmanned, need robust Command, Control, Communications, Computers, Intelligence, Surveillance and Reconnaissance, or C4ISR, capability. “We demonstrated the power of bringing all of CERDEC together to address challenges in autonomous operations. Through teamwork, the team accomplished a great deal and has identified next steps to continue to advance autonomous capability,” he said. Autonomous robots are capable of task execution with limited supervision, and their capabilities continue to advance rapidly. Each of the directorates used their science and technology expertise to enhance the capabilities of the MDAR robots. “We are setting a new baseline for a number of technologies used on robotic vehicles that are a step beyond teleoperated systems,” Shoemaker said. Photo Credit: Kelly White. 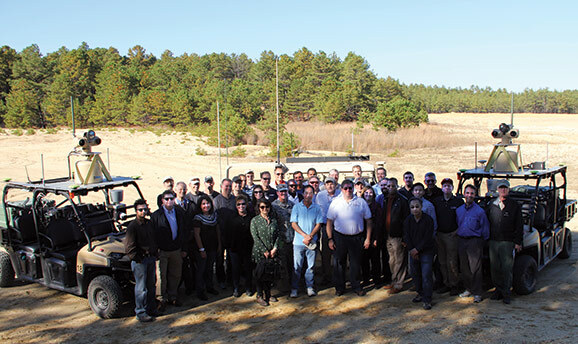 Government and industry personnel attended the Communications-Electronics Research, Development and Engineering Center-Technology Enhancements in Autonomous Machines Robotics Demonstration at Range 1 on Joint Base McGuire-Dix-Lakehurst, New Jersey. The C-TEAM focused on four major areas to include navigation, communications, command and control, and studies to identify new sensors that would provide the look-ahead range, resolution and scan rate to identify a new class of Laser Imagining and Detection Systems, or LIDARS. The U.S. Army Communications-Electronics Research, Development and Engineering Center, or CERDEC, is part of the U.S. Army Research, Development and Engineering Command, which has the mission to ensure decisive overmatch for unified land operations to empower the Army, the joint warfighter and our nation. RDECOM is a major subordinate command of the U.S. Army Materiel Command.